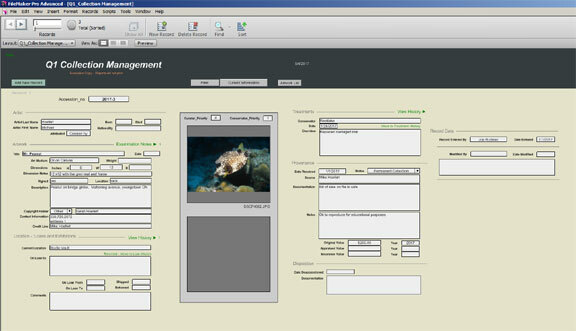 Q1 Collection Management is an easy to use yet powerful artwork management tool. This program has been developed as a result of our 25+ years experience working with museum collections and has been tweaked by the museum professionals who utilize the program. from and exported to different applications, such as Microsoft xls or xlsx files. It also interfaces with our Q2-Conservation software, eliminating the need to re-enter data when performing conservation surveys. 1. Q1 was designed to be easily affordable for the smallest users, while easily expandable to the most complex user environments. 2. Q1 was developed within the Apple “Filemaker Pro” windows environment. An operating system known for stability and cross platform compatibility. 3. Q1 is supplied as a fully functional database. Data modification dates are automatically tracked. 4. Q1 can be purchased with or without access to programming code. 5. Q1 can be easily customized for a specific user requirements. Both in data input and reports. 6. Q1 comes with free technical support for set-up and initialization and 90 days free unlimited technical support. There is no additional cost for customizing up to 2 reports, with low cost options for complete customization. 7. Q1_Runtime is a stand alone, self-contained version of the collection management program. It does not need to be installed on the computer and easily runs from a usb drive. It can be duplicated and distributed as needed. 8. Q1_Runtime can be upgraded to a networked multi-user program, Q1. Password protection and user tracking are available options.